When it comes to deciding on the best VoIP service for a small-to-midsize business, owners have found that the most effective influencers are not on their payroll — but rather an outsourced IT consultant. Why? Because they are SMBs themselves. They’ve walked a mile in their shoes and understand their needs, as they pertain to best the best products and services in the marketplace. IT consultants & Telzio, a symbiotic partnership . . . These are folks who are in the trenches daily putting out client fires and attending to solutions in a timely and efficient manner. IT consultants as resellers are acutely aware of obtaining the best ROI [return on investment] for themselves and their clients. When a VoIP company like Telzio demonstrates how their service is an ideal fit for an IT consultant’s customer, a symbiotic relationship is born. Telzio is a company that demonstrates value, where IT consultants quickly learn that their clients are going to be well taken care of from purchase to customer service. Possibly, the single most important benefit for resellers to work with any VoIP company is seek out one that will provide their client base with a service that will not disappoint. Telzio understands that dynamic and has a strong track record to assure all resellers they are not only a partner but an extension of that delivery promise. The Telzio interface is intuitive and easy-to-use, enabling even non-technical users to customize their features online. No hardware, installation, or contracts are required with Telzio, making activation instant and friction-free. Administrators can manage multiple offices under a single account, regardless of location. Telzio offers unlimited users with every plan, so businesses can bring their own devices and give every employee an extension at no extra cost. Users can choose to use IP phones, softphones, or Telzio’s mobile app, allowing complete flexibility to take their business line and work from anywhere. iHost Networks has been providing powerful, reliable and affordable web hosting for over 15 years to small and medium size businesses. Resellers can benefit from this partnership since iHost has an extensive track record of tens of thousands of happy customers. They offer services from registering domain names to web design, search engine optimization, from e-commerce hosting to shared hosting. Web hosting ranges from $4.95 per month to web design starting at $499. As a Telzio affiliate, new users can obtain a free trial simply by using the promo code: TELZIO1. Third party endorsements back up why many resellers are moving their clients to Telzio’s VoIP services. eKomi is an aggregator of customer reviews that are screened and verified. 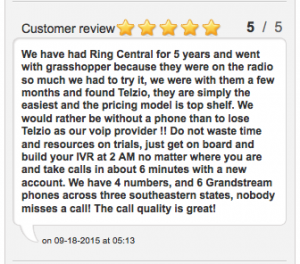 Here, resellers will find testimonials from companies that have not only benefitted by signing up for Telzio’s services, but have switched from other VoIP companies to do so. Curated from reviews received over a 12-month period, to date, Telzio has achieved a 4.8 overall rating out of five. Telzio believes in entering into working relationships that are a win-win for all parties — the IT consultant, their client and Telzio. Technology consultants increasingly serve as an extended IT arm for small and midsize businesses. Salaried IT staff members are at a minimum within most SMBs, as they consistently struggle to contain costs. To that end, when an IT consultant can fill that gap and recommend quality VoIP services, they are on their way to building a long-term value proposition for all parties.